Camphor Daisy, aka Camphor Weed. I wish I could have gotten a better shot of this moth’s huge green eyes. …with ants working on it. Are these scale insects? I don’t know my grasshopper species. Yet. I love the little “The Scream” face marking on the spider’s back. This Tan and Yellow Fly is only about 1 cm in length. Leaf-footed Bug nymph. I read that if I want to be sure what species this is, I will have to catch it and raise it to adulthood. Did the grasshopper molt and leave this behind? Or was it eaten by a very tidy predator? Tiny insects hatching from eggs on the stem of the plant. Differential Grasshoppers have herringbone patterns on their back legs. The camphor daisies (Rayjacksonia phyllocephala) have just started blooming. They are a pretty nondescript plant, tall and skinny, with long tough stems that look like leggy geranium stems, rough thick leaves, and small bright yellow ray flowers. I have been noticing all kinds of insects and arachnids making themselves at home there. I don’t know a lot of the insects – I was able to identify a few new ones from these pictures. If you are interested, you can follow these links to find out more about them on BugGuide.net. Other common names for the plant are golden-aster and camphorweed, but I have a different camphor weed here too, so I am going to stick with camphor daisies on this one. According to one of my Texas AgriLife Extension books, another Latin name is Heterotheca subaxillaris, but I am using the Latin name that the Lady Bird Johnson Wildflower Center uses. 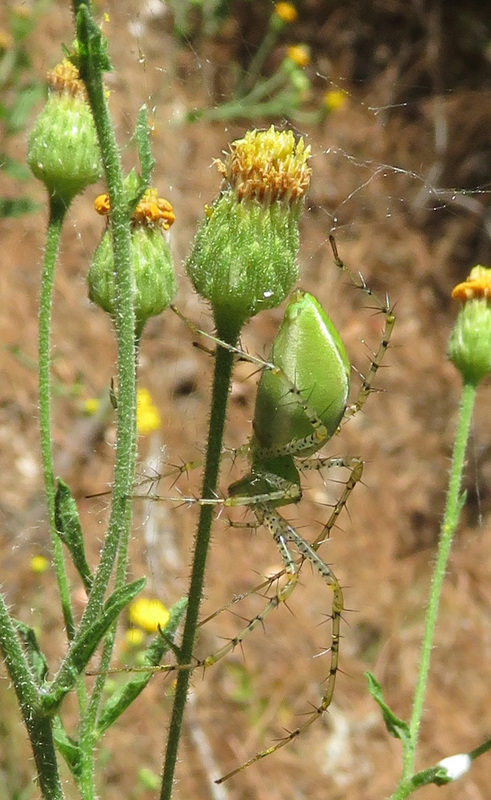 And here is one more picture, of the Green Lynx Spider. I couldn’t get it to show full size in the gallery and I really love her transparent spiky legs. ← Bird Books – Don’t Leave Home Without ’em! Beautiful photos ! I really like the stilt bug and the leaf-footed bug nymphs ! Yes, they are so Dr. Seuss-ish! 🙂 Thank you! Amazing photos! “The Scream” marking cracked me up and may of the others left me breathless!